Skype for Business can leverage security advantages of Modern Authentication. Because Skype for Business works closely with Exchange, the login behaviour Skype for Business client users will see will also be effected by the MA status of Exchange. This will also apply if you have a Skype for Business split-domain hybrid. That's a lot of moving parts, but the aim here is an easy to visualize list of supported topologies. Given Skype for Business, Skype for Business online, Exchange Server, and Exchange online, what topologies are supported with MA? So it looks a bit like this, with EXO and SFBO in the Cloud with Azure AD, and Exchange Server (EXCH) and Skype for Business server (SFB) on-prem. If the icon is dimmed or grey, it is not used in the scenario. SFBO is Skype for Business Online. SFB is Skype for Business on-premises. Authorizing servers are represented by triangles, for example, the Azure AD is a triangle with a cloud behind it. Arrows point at the authorizing server that will be used when clients try to reach the specified server resource. First, let's cover MA with Skype for Business in both On-premises-only or Cloud-only topologies. 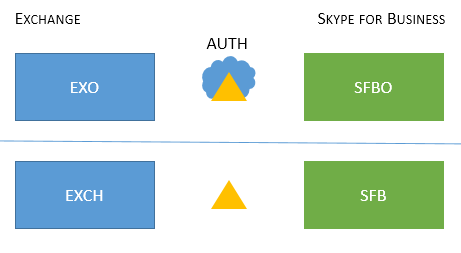 Are you ready to set up Modern Authentication in Skype for Business Online? The steps to enable this feature are right here. MA is on for both EXO and SFBO. Therefore, the authorization server is Azure AD. MA is on for SFB on-premises. Therefore, the authorization server is ADFS. For configuration details, please see this article. MFA (Windows Desktop only - mobile clients are not supported). No Exchange integration features. It's recommended that the MA state be the same across Skype for Business and Exchange (and their online counterparts) to reduce the number of prompts. MA is not enabled for SFB; no SFB MA features available in this topology. No MA features for SFB. MA is on for SFBO only. The authorization server is Azure AD for users homed in SFBO, but AD for EXCH on-premises. MA is on for SFBO, therefore the authorization server is Azure AD for users homed in SFBO. On-prem users in SFB and EXO use AD. MA is on in both EXO and SFBO, therefore the authorization server is Azure AD for users homed in SFBO; on-prem users in EXCH and SFB use AD. Please see https://aka.ms/ModernAuthOverview for deployment steps. MFA, CBA and CA/MAM (via Intune) for all users. * - MFA includes Windows Desktop, MAC, iOS, Android devices, and Windows Phones; CBA includes Windows Desktop, iOS and Android devices; CA/MAM with Intune, includes Android and iOS devices. It's very important to note that users may see multiple prompts in some cases, notably where the MA state is not the same across all the server resources that clients may need and request, as is the case with all versions of the Mixed topologies. Also note that in some cases (Mixed 1, 3, and 5 specifically) an AllowADALForNonLynIndependentOfLync registry key must be set for proper configuration for Windows Desktop Clients.